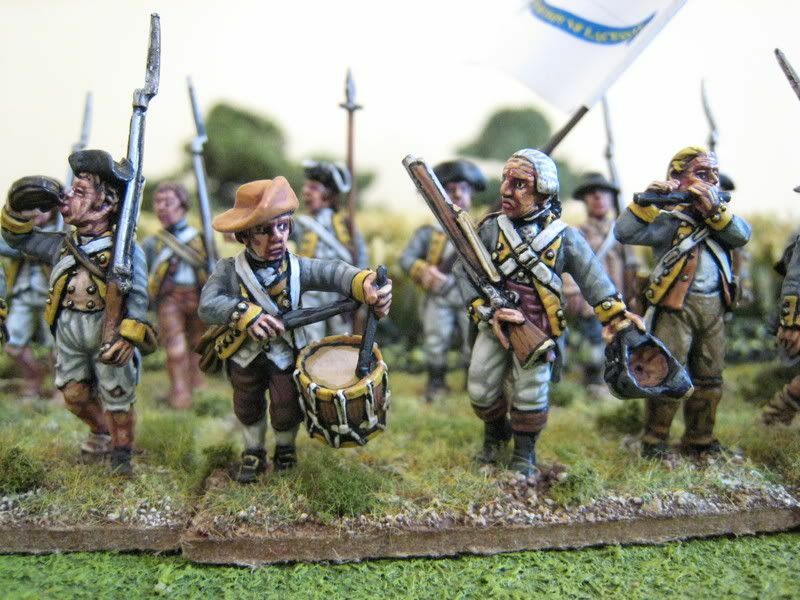 Finished at last, here are pics of my latest regiment, which I have designated the 10th Virginia Regiment. I suppose there are essentially two ways of modelling American regiments. First, you can paint them up in common, generic colours (e.g. coats that are blue faced red or brown faced red, or hunting shirts, or a combination of shirts and coats) and use them for whatever regiments you like. Secondly, you can research to see what uniform a particular regiment might have worn at any one time and paint it up accordingly. I have used the Brandywine order of battle at a focus for my Americans and generally follow the second method. Researching uniforms is quite fun and I'm keen to ensure that my American regiments do not all look the same - often you come across a particularly colourful uniform which looks good on the tabletop (such as Webb's Additional's scarlet faced yellow coats) and breaks up the mass of dark blue and brown. So when painting I give names to my American units and try to model them according to whatever uniform records are available, even though when it comes to games I just put whatever is to hand on the table and don't worry if the "1st Maryland" is standing in for the "4th Virginia". Something else I like to do is to see what interesting flags are commercially available and then paint up the units that go with them. In the case of this unit, I came across an illustration in Mollo of a private in a grey coat with yellow facings. The caption simply states that the figure is taken from a von Germann drawing. I liked this combination of colours and so looked around to see if there was a regiment I could use for it. The Brandywine orbat has the 10th and 14th Virginia Regiments combined together in an 18-figure unit in Weedon's 2nd Virginia Brigade (in Greene's/Knyphausen's sector of the battle). That met my purposes because I wanted another 18-figure unit and the rather "Johny Reb" look of the grey and yellow coats seemed suitable for a Virginia regiment, given that I couldn't find much information about what uniforms the 10th or 14th might have worn. The figures are mainly from the Eureka "ragged Continentals" range. Strangely, Eureka make a standing officer and drummer to go with their firing line figures but don't produce a marching officer or drummer. For those I used Foundry figures: the drummer is from one of the Foundry Continental command packs and the officer is actually a British regular (but since he's not wearing any button-hole lace it doesn't matter and, in fact, the same figure but with a head-swop appears in the Continental pack). I've found that the faces on these Eureka figures require slightly different handling to Perry/Foundry faces; Eureka have quite pronounced eye-lids which make painting eyes much harder. I'm also not entirely sure what the chap with his right arm outstretched is supposed to be doing - I thought perhaps asking for his water bottle back, but he has one slung over his shoulder. Another point is that the pointing "sergeant" in the second rank shouldn't be carrying a spontoon: only officers carried these. Anyway, I love these figures; they paint up well and really look the part. The cornfields are newly acquired items from Touching History - very effective and an extremely worthwhile purchase. I have heard people say "it's just astro-tuft; go and make them yourself". Even if I had the time and inclination to have a go at making these (which I don't), I'm sure my efforts wouldn't be half as good as these ones. The inner sections can be lifted out and the ground underneath is fully roughed-up and painted accordingly - I shall post pics of this when I finish my farm hands and field workers, next up on the painting production line. £50 (or thereabouts) bought me enough fields to cover almost an entire 2 foot square TSS tile, so if you fancy some drop Paul Darnell an email and treat yourself. 18 figures. Painted July/August 2007. Flag from "Flags for the Lads". I don't have any new wargaming photos so thought I might as well post a couple of Prague, where I spent the bank holiday weekend. 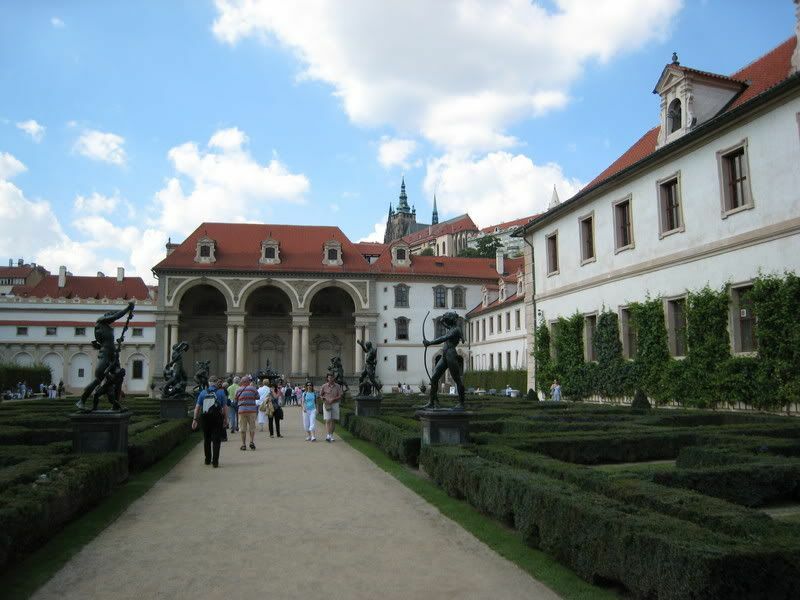 Those who have been to Prague will know how beautiful the city is and how spectacular the Hussite architecture. Add all the beer and beautiful women and you have a lad's perfect weekend destination (unless you have a fiancee in tow....). The city has a real sense of "old Europe" about it; you quickly get the feeling that it has been there for thousands of years. The castle and main square are apparently the largest of their kind in Europe. It was a little strange to find a central European city that seems virtually untouched by WW2. But of course that is only architecturally speaking, and a visit to the exhibition at the Jewish Cemetary was a grim reminder of the human cost of the war. The shopping was very good. Whilst the Kiwi was busy stocking up on Bohemian glassware, I discovered that cds are generally half the price they are in the UK and I have been listening to Smetana, Dvorak and Martinu almost continuously since we returned. Czech wine was pretty much what I expected - good, if slightly unsophisticated, Germanic whites and rather strange reds. I came across Frankovka for the first time, a native Slovak grape for red wine that goes quite well with goulash but is probably better suited to cleaning bathrooms. 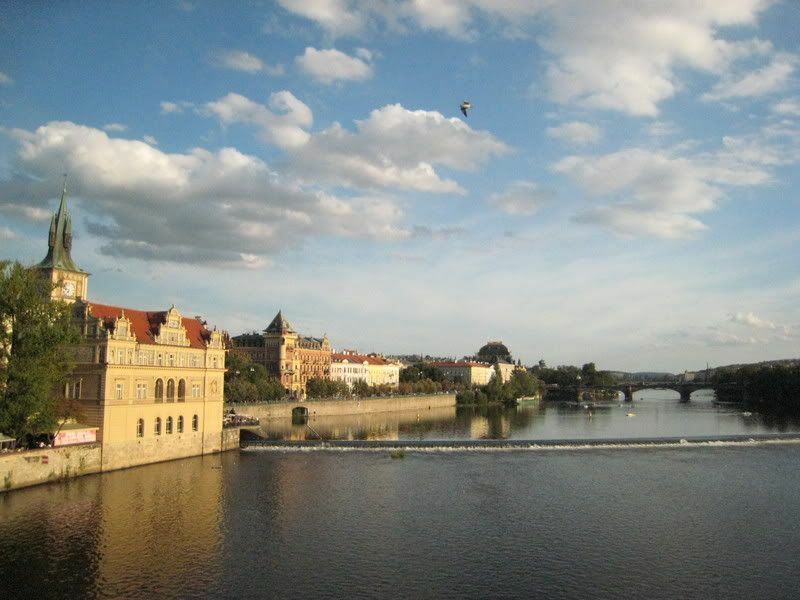 The picture above shows the Vltava from the Charles Bridge and the photo on the left below is of the parliament building with the castle in the background. Anyway, on to the military stuff. Prague has a large number of museums, most of which I failed to visit in the 4 days I had (and they are all closed on Mondays) , but I did manage to squeeze in the Army Museum. As the name suggests, this is a museum about the Czech Army and the wars in which it fought, so the story begins just before the start of WW1 and continues up to the present day (I didn't manage to work out where all the Hussite armour is, perhaps in the National Museum). The exhibits are well-presented most of the captions are only in Czech. I saw dozens of medals and Czech uniforms but couldn't work out what they were. 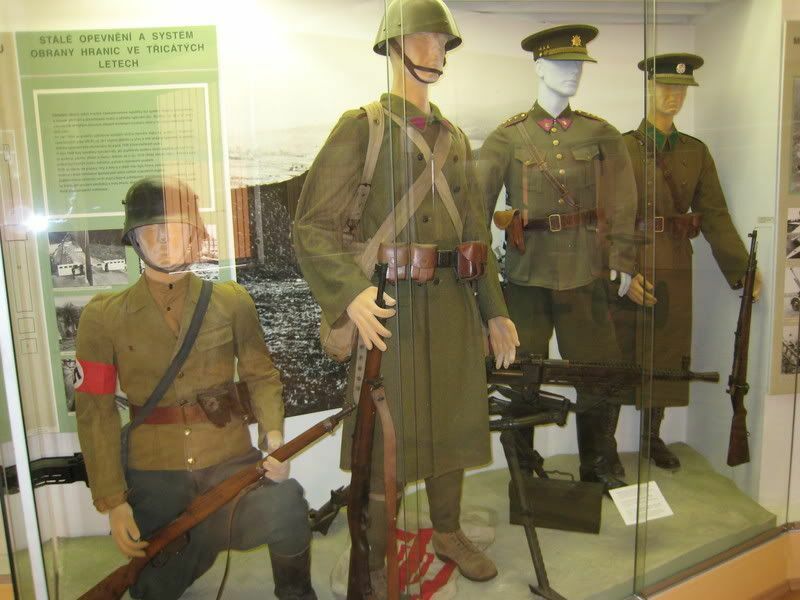 Most of the exibits concerned the two world wars, and it was interesting seeing uniforms and equipment from the Balkans Front of WW1, which in the UK at least is always overshadowed by Flanders and Gallipoli. The exhibits weren't that photogenic, but just to show that I did actually visit I have posted one photo below. These are uniforms from the early 1930s. The one on the left was worn by the Prague Frei-Korps. The caption to this uniform was the only one in the entire museum that had an English translation, which told me that the Frei-Korps "were traitors to their country and vexed and murdered their fellow citizens".....I'd also forgotten that Prague is where Czech commandos assassinated SS General Reinhard Heydrich in May 1942. The museum has photographs of the commandos and some of the equipment they carried. The Nazi reprisal was merciless - the village of Lidice outside Prague was completely destroyed and about 340 of its inhabitants killed. My Sitemeter counter seems to have vanished, so I have no idea how many people are reading this blog. I assume there are at least 6 readers, judging from recent comments, so my apologies to them and others for the lack of posts recently. Work has been very busy and things I have meant to do just have not been finished. The 10th Virginia still awaits basing and the 20th Foot is only half-finished. I am going to Prague for a few days tomorrow morning so these units are unlikely to be ready for photos for another week or two. Once the 20th Foot is out of the way I want to paint Gover's Marbleheaders. 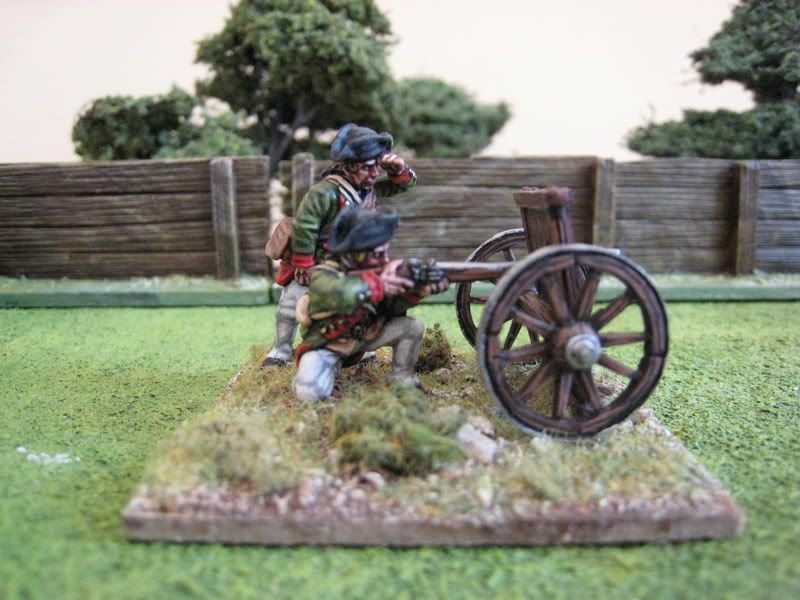 There's also the Hessian artillery I failed to paint this month, and ongoing Sudanese Beja. But in the meantime I thought I would post some pics of something I've been working on sporadically over the past couple of weeks, Newcastle's Whitecoats. 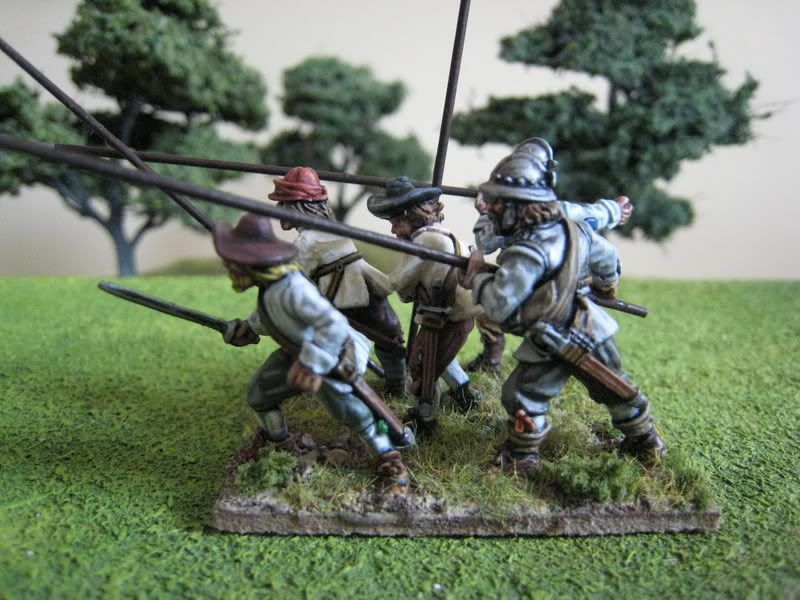 The English Civil War is one of a handful of projects that I keep meaning to get stuck into. 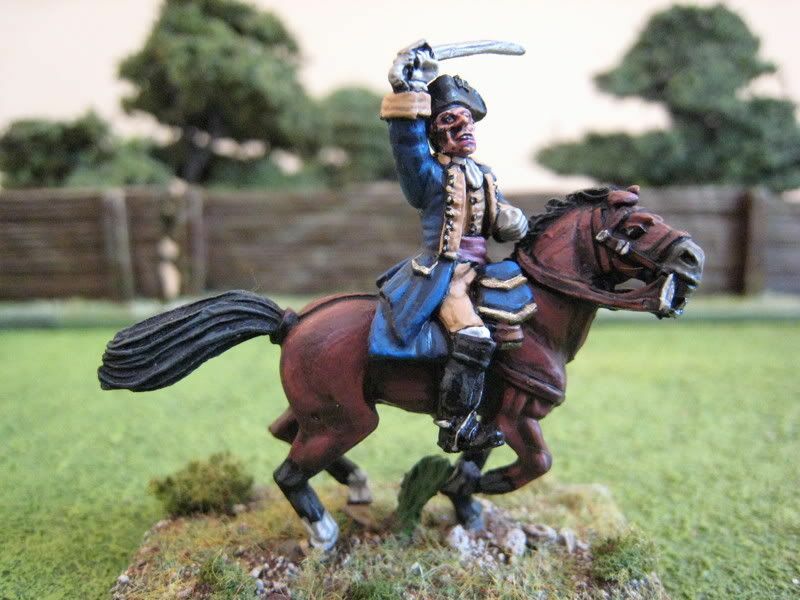 I bought some Renegade figures a while ago and then some Bicorne packs at Salute in April, but never found the time to paint any of them. 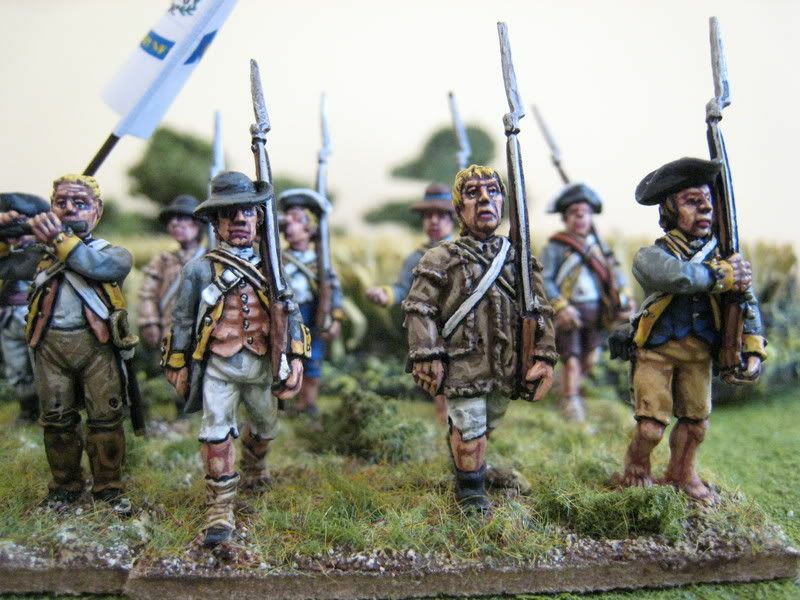 I have now started painting this Royalist regiment as a tester. The aim is to present Newcastle's Whitecoats as they might have appeared in the closing stages of Marston Moor. The regiment will have 5 stands with the figures based quite densely, 5 or 6 to a base. This confused, "in the think of it", look was inspired by similar regiments that David Imrie and Barry Hiton have done - I imgine this action-packed style has been copied many times. This stand is the second base and consists entirely of pikemen, although one figure had dropped his pike to get stuck in with his sword. 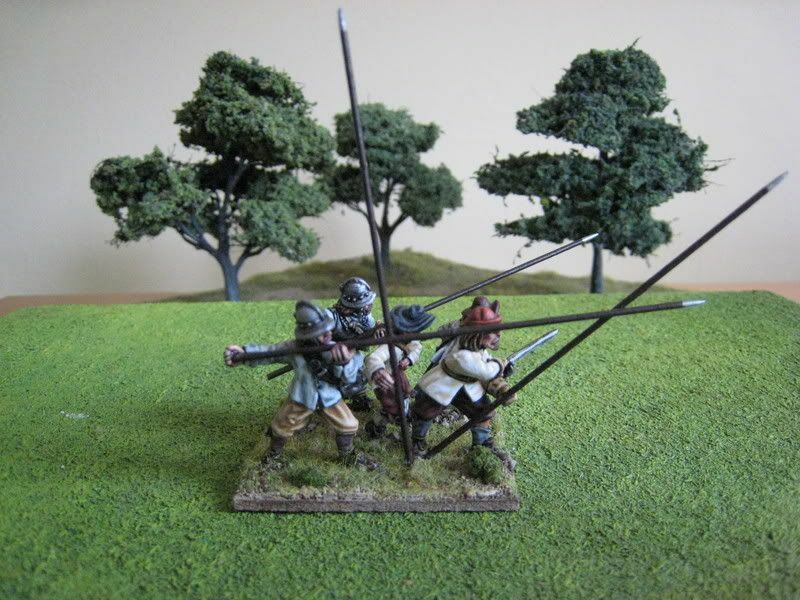 The other stands will each have 2-3 musketeers and 1-2 pikemen. The front 3 figures are from the Bicorne range whilst the back row are from Renegade. I'm hoping I can finish off the rest of the regiment during September. It should like quite effective once all 24-odd figures are painted and based. These three Continental generals are all Old Glory sculpts. Old Glory's figures generally can be rather hit-and-miss, although their AWI range is one of their best. 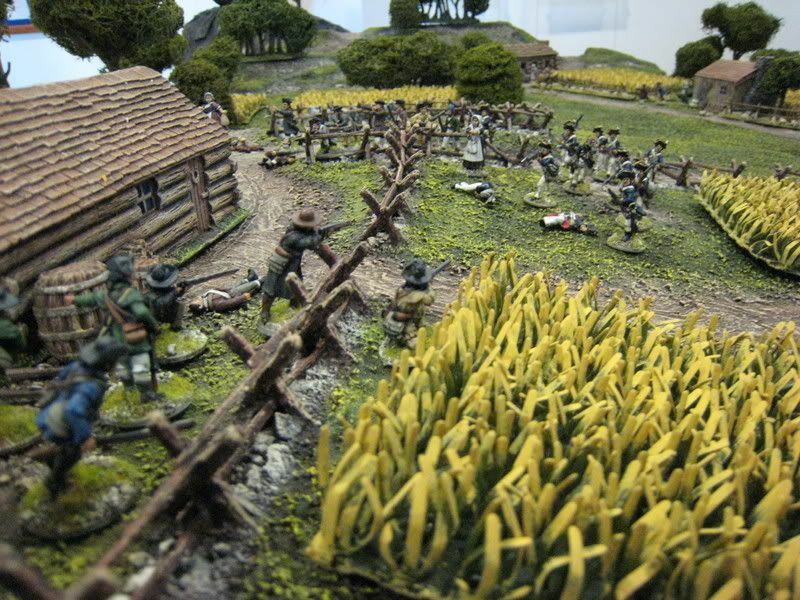 The range includes many more types of American troops than the Foundry/Perry range (such as Continental marines and figures in light infantry caps). Old Glory also do French troops, the British Legion and lots of personality figures. 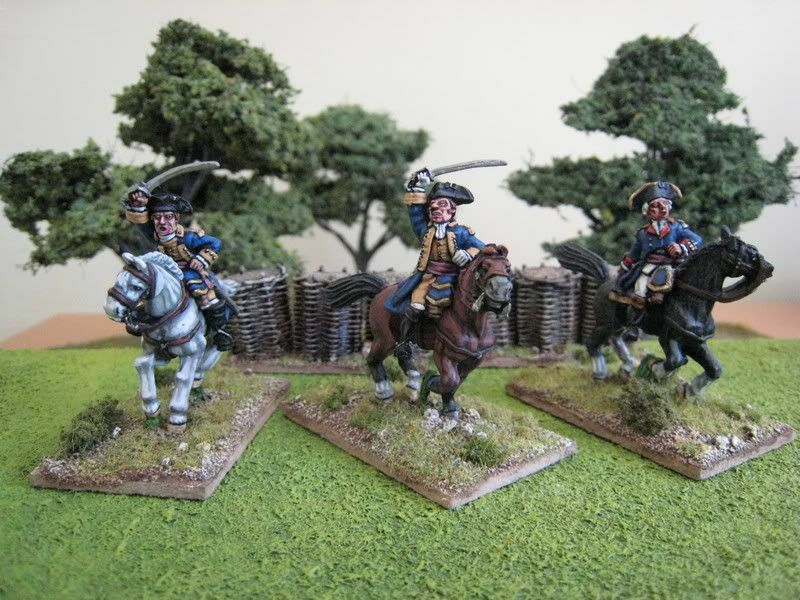 The two figures shown below are from the pack "Continental Mounted Colonels" whilst the figure on the extreme right above is actually from the "British Mounted Colonels" pack. I bought the two packs at the same time and they became muddled together, but I don't think it makes any different - the uniforms were much the same. That said, the two "Continental" figures have button-hole lace, which I'm not sure they should do as the Americans generally did not wear it. Even British officers tended to remove their lace as the war progressed. I don't think generals should be wearing cummerbund sashes either, although they would be correct for infantry officers. One of the weaknesses in the Old Glory range is the horses, most of which are in rather strange poses. They usually look as if they are just about to fall over a Grand National fence, the upper legs often have large chunks of metal on them which can take ages to scrape away and there's always the problem of the saddles not fitting on the horses properly. All that said, I think these Old Glory figures have "character". I don't mean that in the euphemistic sense of them being rubbish sculpts, but rather that they do capture something that can often elude other manufacturers. Not in the Perry class certainly, but then the Perry range only has one pack of generals for each side and you will need a few more. These figures are advertised as "colonels" but I have painted them as generic generals. 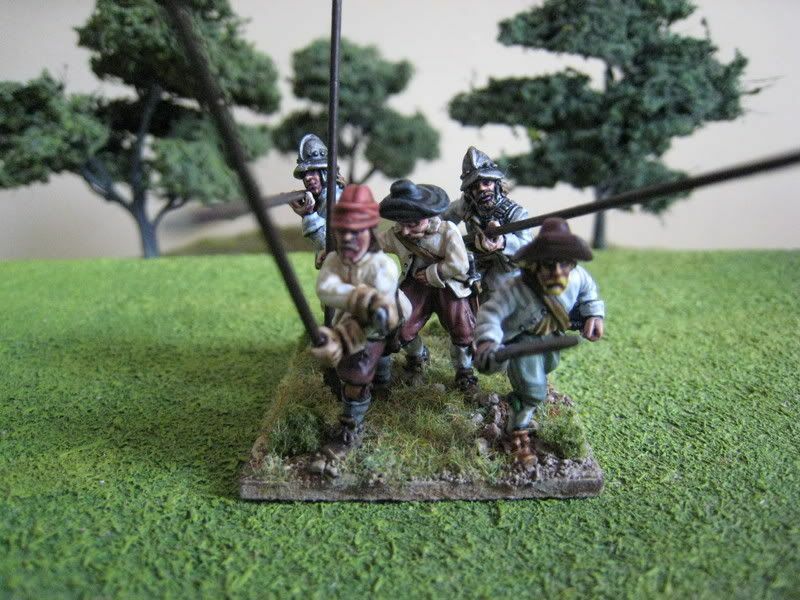 This is the latest pack to be released by Perry Miniatures. It is a powder cart that can be used for either side. 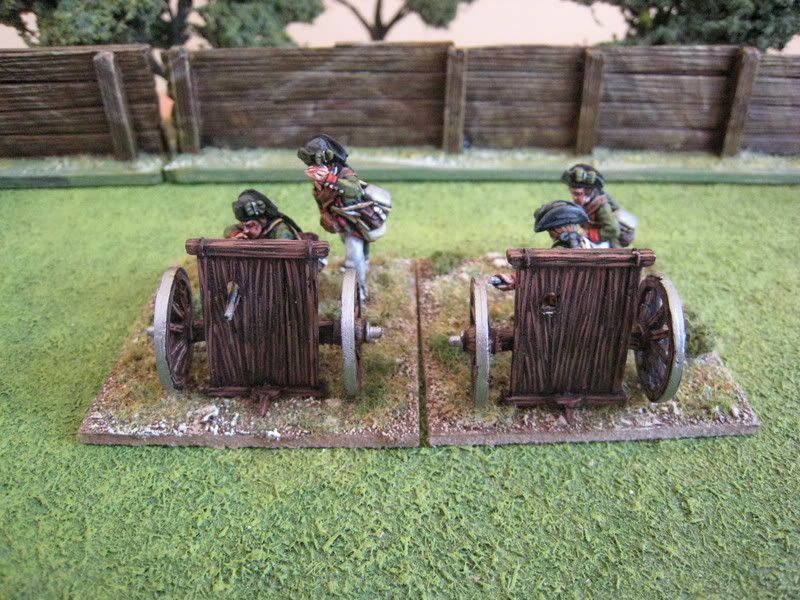 I do not know if British wagons were painted blue-grey like the artillery pieces themselves, but I wanted this to be usable for both sides anyway (what's the military/wargaming term for "unisex"....?). 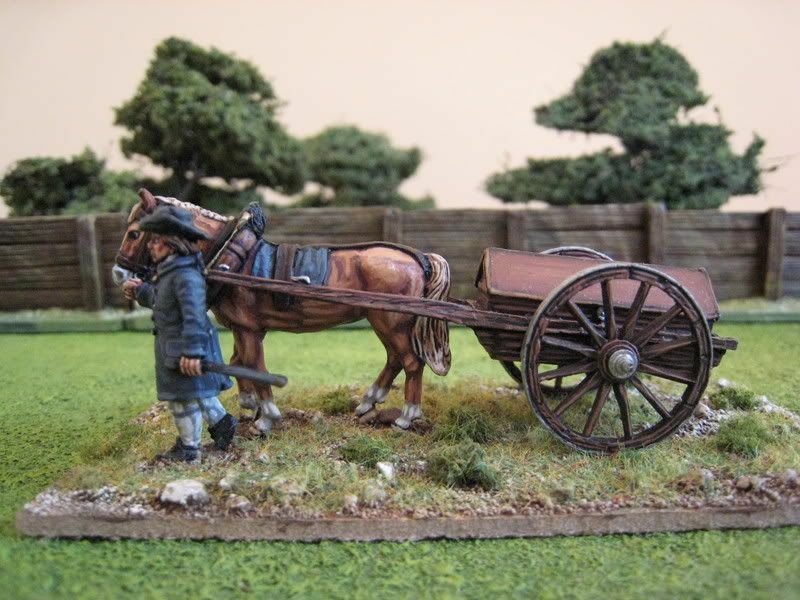 The cart itself was painted with the 3-colour Foundry "Spearshaft" palette over a base coat of GW's "Scorched Brown" washed with dark brown ink. The wood grain effect is easy to do as it is largely sculpted into the metal. 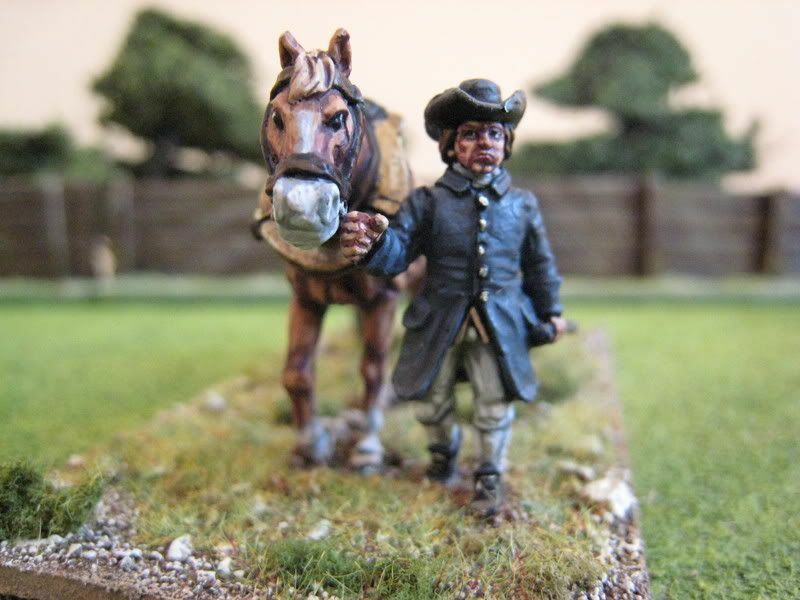 The horse was painted using the Foundry "Chestnut" palette over a base coat of Foundry "Bay Brown B"; white was added to "Chestnut C" for the final highlight (no dry-brushing was involved). The mane and tail were painted with the Foundry "Boneyard" palette and a couple of brown ink washes, with pure white then used on the bottom of the tail (if you look at pale coloured horses' tails you can see that the bottom of them is often quite a bit lighter than the top). 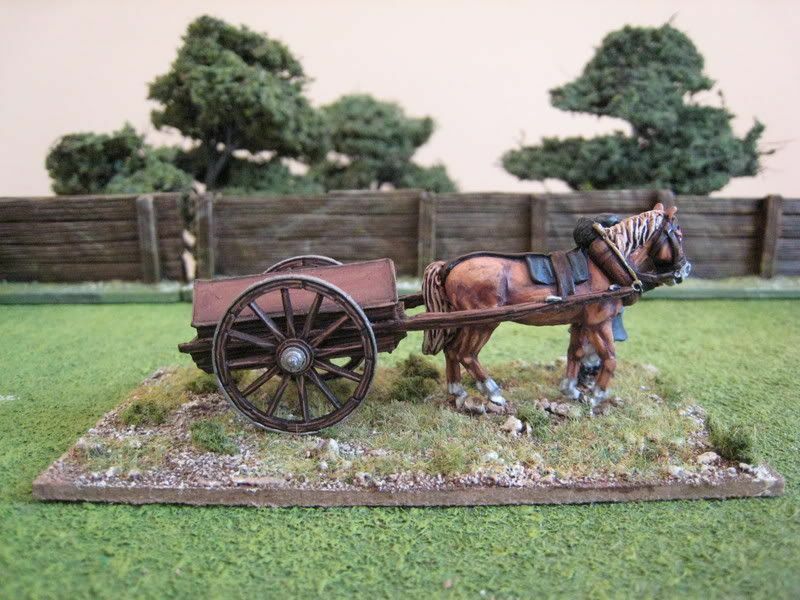 This is a neat little set - with the earlier limber and ammunition cart it makes an effective artillery train. Yesterday I went to what must be one of the UK's smallest wargaming shows, "Whiff of Grapeshot" at "Firepower", the Royal Artillery Museum in Woolwich. I had not heard of this show until last week. I'm ashamed to say that I hadn't heard of the museum either, even though I live just down the Thames from Woolwich. The museum is wonderful - it is basically a display of artillery from the early 17th century up to the Cold War and contains some fantastic pieces (and some medieval stuff too). It is easy to forget just how large these guns are, until you stand next to (or underneath) them. There was plenty of late 18th century stuff which I enjoyed inspecting. Particularly interesting was a cabinet containing the citations of all the artillerymen who have won the Victoria Cross. What did I learn that will help with painting and wargaming? 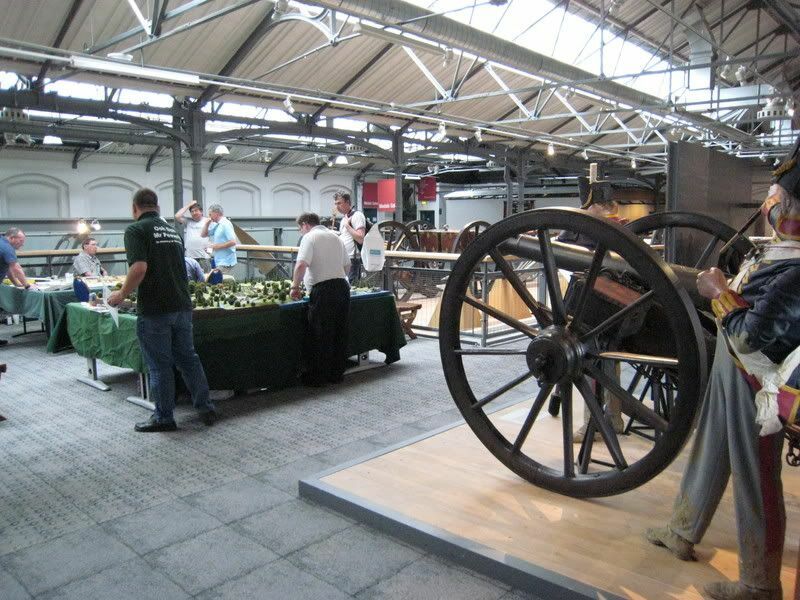 In an earlier post on British 6-pounders I queried whether the gunners would be standing within the wheels of the gun - at the museum was a Napoleonic gun (I forget the calibre....) which had a replica gunner doing just that; there was plenty of space for him. I have also wondered what the colour should be of the top of the ammunication cases that sit between the wheels and the barrel - well the covers are clearly leather (not wood or metal as I had thought previously) and so a bit of re-painting may be in order. Very useful. There were about a dozen games and a decent number of traders. A couple of people said footfall was fairly low, possibly because Britcon was on at the same time. That said, there were several families there, which you don't often see at shows. I passed the Touching History stand first and thought I'd pick up a couple of pieces once I had done a circuit of the entire show. Even thought that circuit took about 15 minutes, by the time I returned the redoubt I wanted to buy had been sold! That will teach me....But I ordered some wheatfields which will come in handy when I paint up some Foundry civilian farmers later in the month. The Touching History AWI display was fantastic, and a couple of pics are below. More can be found on the Touching History website which I had added to the links section. 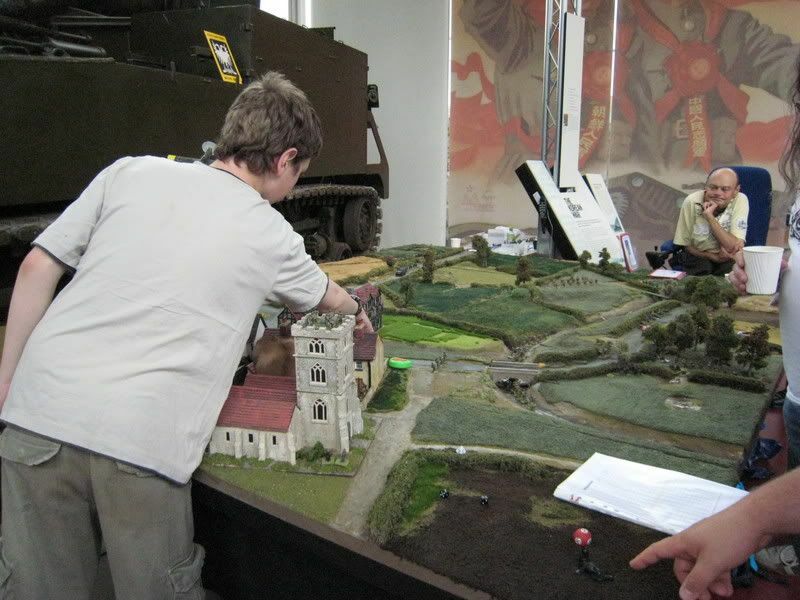 The photos above show the 25mm WW2 "Attack on Pevensey" games that Levied Troop and the South East Essex Military Society put on, together with a general shot of the upstairs gallery, with that Napoleonic gun in the corner. Dave Thomas had a huge selection of miniatures. After my Touching History disappointment I was tempted to fill my rucksack with Perry and Conquest goodies, but given that I've already mapped out my painting schedule up to the SELWG show in October I resisted, and settled for a couple of packs of Mahdists and some more Iroquois. I also had a very enjoyable chat with Henry Hyde, editor of the top-notch "Battlegames" magazine (hard to believe it's already 2 years old), and Mike Siggins, voice of the hobby since, well, the dawn of time really. 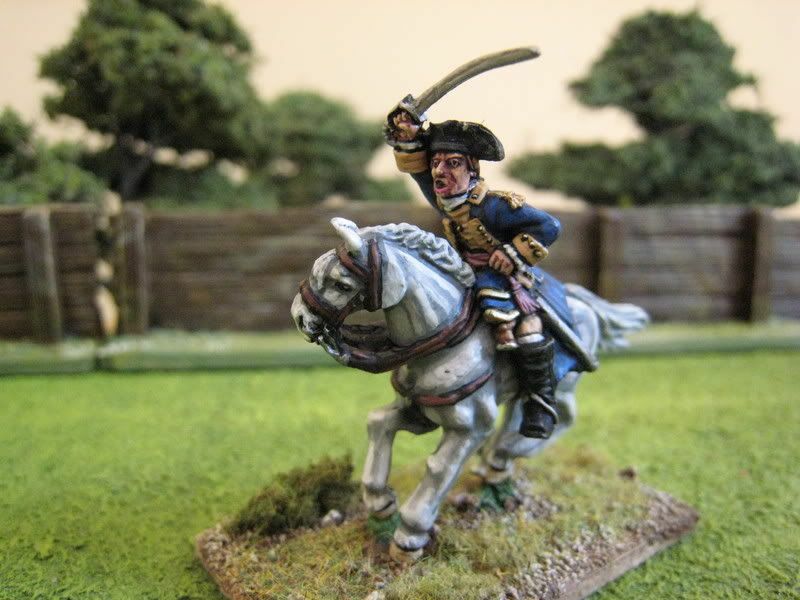 As a result of that chat I will be dusting off my Napoleonic Dutch-Belgian cavalry and painting up a few others.......more on that anon. This museum is well worth a look when passing through London. There seems to be some doubt as to whether it can survive the demands of property developers and a local council keen to make some easy cash by selling the site off. To lose a museum like this would be a small tragedy, although sadly not surprising in today's history-despising times. I will certainly be making another visit later in the year and will add this show to my handful of "regulars". 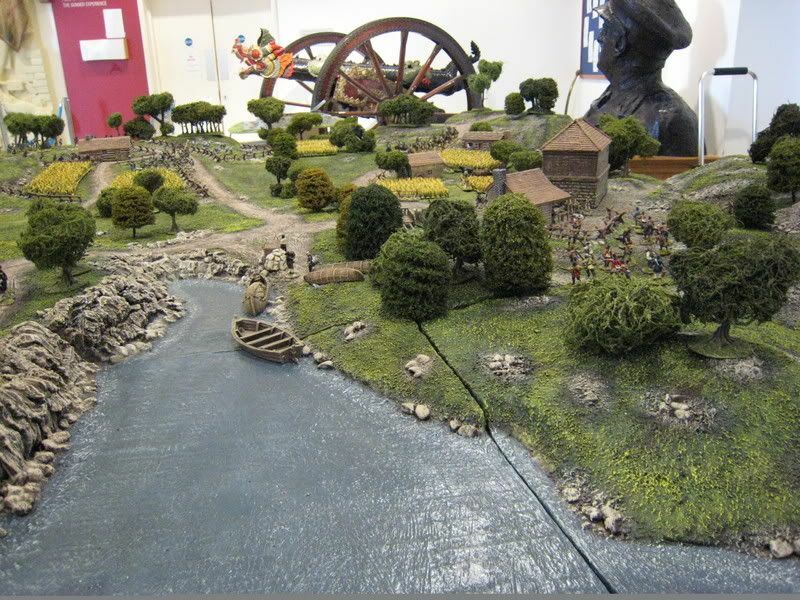 Many thanks to the Gravesend Wargames Club for organising the show. 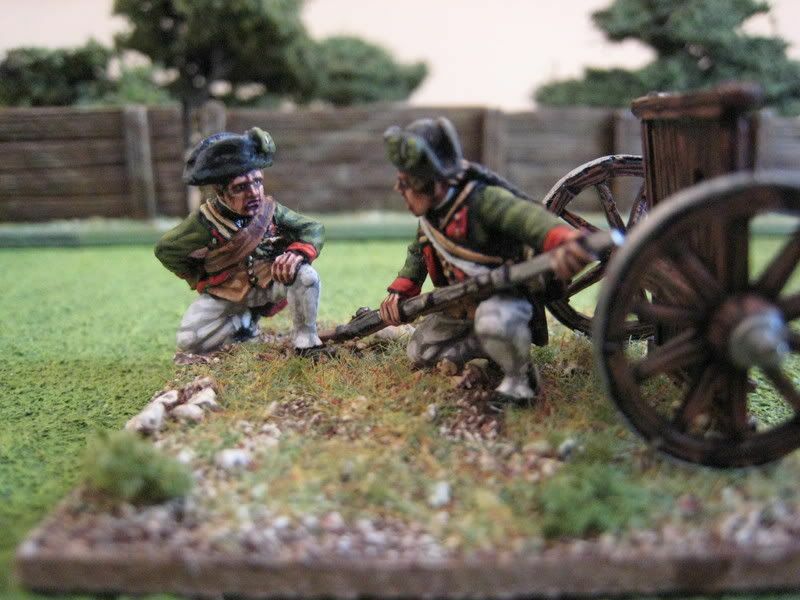 Perry Miniatures recently released a pack of two "amusettes" with Hessian jaeger "crews". Rodney Atwood's "The Hessians" doesn't seem to mention the amusettes specifically but there are various references to jaegers being involved in ford and river crossings, at which I understand the amusette was used. The jeager uniform was painted using the Foundry "Phlegm Green" palette. This morning I am heading off to the "Whiff of Grapeshot" show at Woolwich's Royal Artillery Museum, which I have never visited before. Touching History have an AWI game and if my camera battery holds up I will take some photos for posting later tonight or tomorrow. 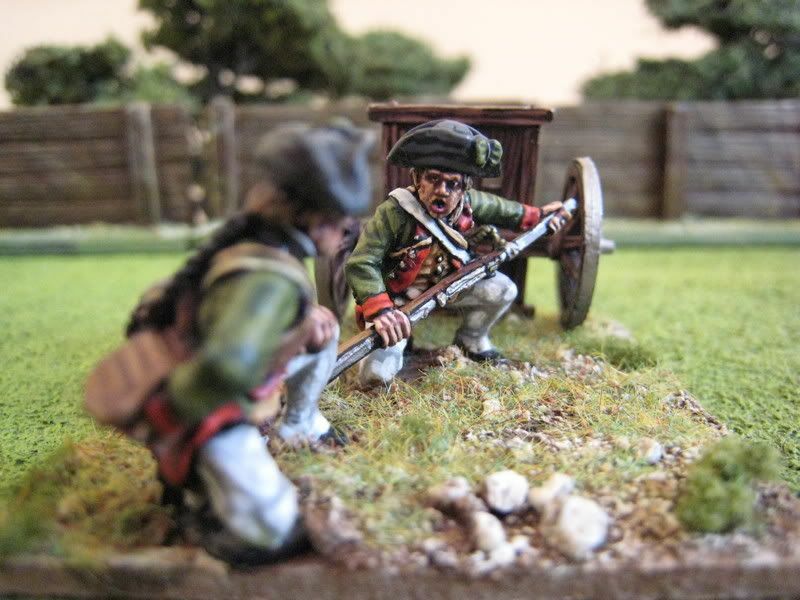 I have also taken photos of some American generals and a powder cart that I have recently painted for posting next week. On the painting front, I have had a "mini-slump". 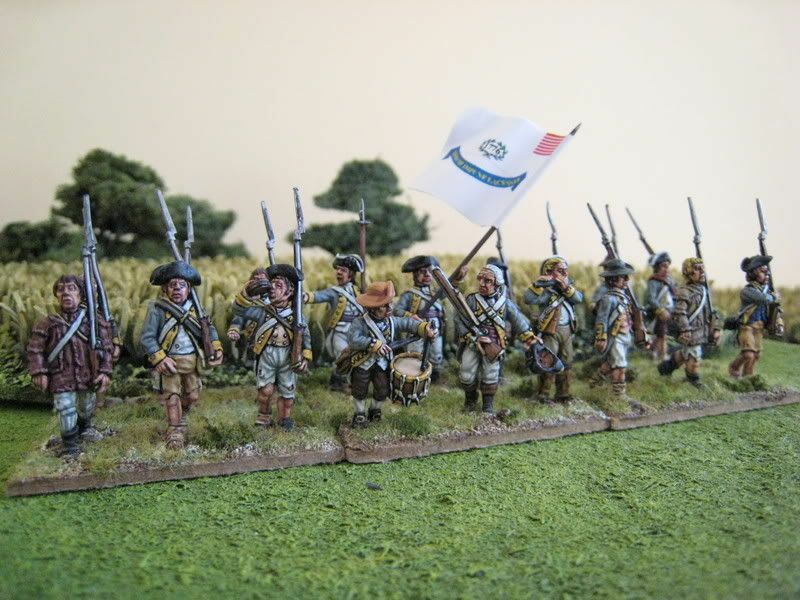 The 10th Virginia Regiment is almost finished, as is the first base of my ECW "Newcastle's Whitecoats" unit. I might put a pic up of the latter once the pikes have been added. 4 figures. Painted July 2007.